The aims of this study were to identify resistance to spot form of net blotch (SFNB) in spring barley and to investigate the stability of SFNB resistance in Morocco. The seedling resistance to SFNB was evaluated by inoculating 340 barley genotypes with the Pyrenophora teres F. maculata (Ptm) isolate FGOB10Ptm-1 (FGO) in the greenhouse. The same barely genotypes were evaluated for adult-stage plant resistance to SFNB in field trials in Morocco. All experiments were conducted in alpha-lattices with two replicates. SFNB disease severity was estimated on barley leaves using double digit scale. To investigate the stability of both qualitative and quantitative resistance to SFNB, 104 barley genotypes were subjected to AMMI analysis. Differential responses of SFNB barley resistance to FGO were found at the seedling stage in the greenhouse. Twelve genotypes showing scores of <1.5, at the seedling stage, were determined to be highly resistant to FGO. The ANOVA showed highly significant (p < 0.001) effects of genotype (G) and G × E (E-Pathotypes of SFNB) interaction on SFNB severity among the 340 barley genotypes at the adult plant stage. The AMMI ANOVA showed that IPCA1, IPCA2 and IPCA3 accounted for 77.9% of the variation of the G × E interaction for SFNB severity. The G × E interaction consisted of divergent genotypic responses to SFNB severity due to different pathotypes prevalent in hot-spot environments. The AMMI stability value demonstrated that barley genotypes AM-14, 30, 31, 68, 107, 108, 112, 149, 170, 185, 204, 240, 304, 326, 326 and 337 were resistant and stable across hot-spot environments against SFNB. Divergent environmental responses of SFNB were recorded in MCH_2015, SE_2015, AT_2016, SE_2016 and JS_2015. Stable SFNB resistant genotypes are valuable resources for the introgression of qualitative and quantitative resistance to barley in Morocco. The online version of this article ( https://doi.org/10.1007/s10658-018-1575-8) contains supplementary material, which is available to authorized users. The authors are thankful to the research technicians of ICARDA and INRA-Maroc in all of the test locations. The funding for this research was provided jointly by ICARDA and CRP-Dryland Cereals. Authors are thankful to Mr. Alex Marcus Batson from Washington State University, NWREC, Mt. Vernon for his critical review and English editing. 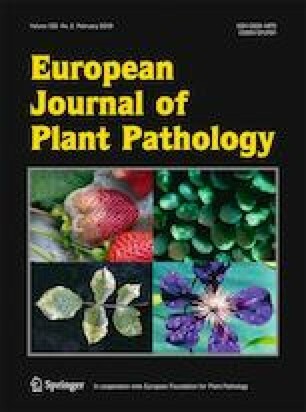 All authors of this manuscript are aware of the content of the article and have agreed upon it submission to European Journal of Plant Pathology. The manuscript has not been published in whole or part elsewhere. The manuscript is not currently being considered for publication in another journal. The manuscript is not split up into several parts to increase the quantity of submission.